New digital literacies? Nah, it’s same, same but different. One of the things I’m exploring on this blog is ways of writing in a way that is more open, more iterative, like my whole Writing the Article Series (start here, or browse through the category). But I’m aware that I’m not doing this in a vacuum, nor am I doing it in a way that radically breaks with past forms of authorship. You may know that I’m doing a Masters part-time at the moment, and a number of the articles I’ve read for it take these infuriating intellectual short cuts where they claim that things are all different now, because interwebs. So when I read this one, I felt the internet was in need of a history lesson. So, if anyone else wants to know: this is why ‘digital culture’ is not what’s destroying your stable academic texts. At the centre of many of the rather splendid heraldic crests proudly sported by our older universities lies the image of a printed text. The bound codex. This is not surprising, as in earlier centuries many universities were the printing houses of their town or city, and tended to regulate what was permitted to be printed. Cambridge University Press in the UK remains the oldest publishing house in the world. Harvard University’s crest features three open texts with the word VE-RI-TAS emblazoned across them. Truth becomes identified with and embodied within the bound text. We still swear ‘the whole truth’ on such a bound text in our courts of law. The printed page, and the wider print culture through which it is produced becomes the basis of reliability, of authorship, of academic authority and the higher education institutions in which it is inscribed (Bayne 2006a). Land, R. (2011) Speed and the Unsettling of Knowledge in the Digital University. In R. Land and S. Bayne (Eds) Digital Difference. pp 61-70 Rotterdam: Sense Publishers. I’ve been feeling uncomfortable with Land’s characterisation of traditional education for about 3 pages, when on p. 63, it finally crystalises. Land misrepresents the medieval text that the Harvard and Cambridge crests are referencing. The medieval text was, of course, radically different from the nineteenth-century mass-market text, but neither was as stable, as secure, as monolithic as he suggests. In the exposition which follows, I’ve skipped over the 17th and 18th centuries when Harvard was founded and the authority of texts were coming under sustained scholarly attack (from Milton’s Paradise Lost which wrestles with Biblical authority, to the Prolegomena ad Homerum, which founds source criticism). I’ve also skipped over the early 20th century, though that is the period when, for example, Walter Benjamin suggests that the gap between author and reader had never been so small, or their roles so interchangeable (in his classic essay ‘The Work of Art in the Age of Mechanical Reproduction‘, 1936). You cannot make an argument about the new things you can do with digital pedagogy based on a straw-man version of history. Medieval texts were characterised by ambigious concepts of authorship, they were multi-authored (frequently anthologies rather than single author works), personalised (written for a specific donor, copied out by hand in scriptoria, or printed on short run, hand-carved, woodcuts), and therefore dangerously prone to alteration and scribal error. The text was a site of anxiety, at the same time that it was the site of authority (in the Bible, Doomsday Book, or statute book). 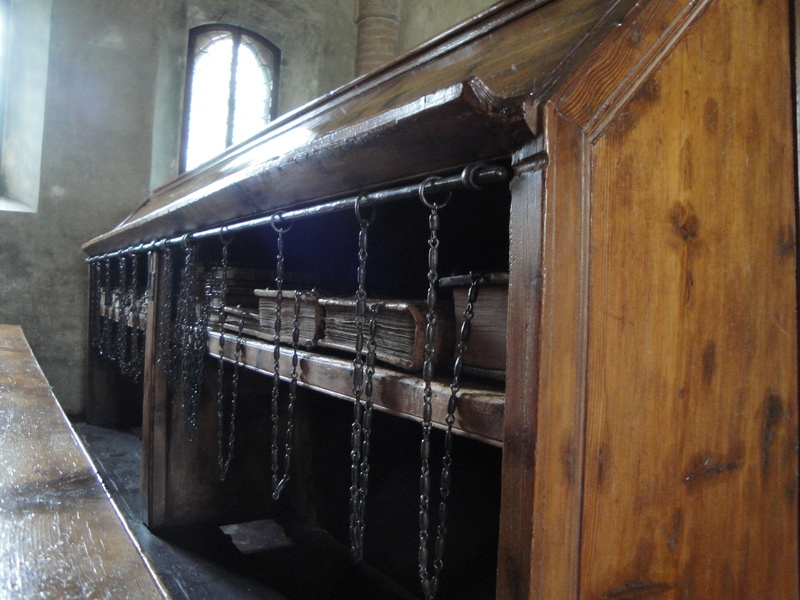 Moreover, because knowledge was held in scarce and fragile codices, it was the task of the library or university to protect them from theft or vandalism, by chaining the books to the shelves (as they did in Oxford) or by locking them in a chest and storing them in a church tower (as they did in Cambridge). This is because of the extreme danger they otherwise faced (such as when books were burned as part of the Peasants’ Revolt in 1381 in London, Cambridge and Ipswich, because they were associated with the Law, the nobility and the land-owning universities). The 19th-century text was not totally bounded, fixed and authoritative either. Marginalia and annotations opened up a range of discursive practices (both social/public and private), in which the reader could disagree, correct, approve of, or amend the printed word (do read this fascinating article on early 19th-century reading practice through the lens of what Mr Bennet might have been doing in his library). Sometimes these annotations were extensive, widely shared among an intellectual coterie, and may even form the basis for a new work, for example Coleridge’s practice (and in this way, the annotations of Erasmus and the annotations of the Romantics have a lot in common). Less authoritative texts, like novels, might be circulated first in a periodical, such as Dicken’s weekly magazine All The Year Round, which allowed the author to respond to reader’s comments and requests, highlighting popular characters or altering the fate of the hero. The novel would then be edited and rebound in three volumes, and distributed through circulating libraries, which meant that although the reader might hold a third of the book, the other two-thirds were held by other readers. Books were therefore not secure, stable, singular entities. Even at this time, reading practices were not necessarily silent and individualised. It was common for the works to be read aloud to a group, even in middle class-families with high literacy. In fact, reading alone was often considered dangerous and unhealthy for women. And of course it was far more common in lower-income groups where not all the members of a household might be literate: I’m thinking here of ‘He do the police [as reported in the crime sheets of the Police Gazette] in diff’rent voices’ in Our Mutual Friend by Dickens. What’s more, books were objects (as Leah Price explains in her fascinating How to do things with books in Victorian Britain): to be hidden, used, repurposed and displayed. Yes, let’s talk about what texts used to do, and what they can do now. Yes, let’s talk about what has changed. But let us not posit changes against an imaginary past that ignores what we know about it. And let’s not reduce the human beings of the past to simple folk who have been trampled under the feet of our hectic democratic technocracy. Rather, let us suggest ways in which attempts to control disseminated, populist and democratic texts continue; and where the balance of making public while securing ownership is maintained by universities, through chained (but therefore publically accessible) books to JSTOR log-ins, and copyright law. Let us note ways in which the technological advances of 13th-century questiones, 15th-century marginalia, a 16th-century chalk-board, the 19th-century periodical novel, and a 21st-century blog might be part of a continuum of the negotiated and co-created text. Next What is reflective learning? I both agree and disagree with you blog post. A little context about me. I am currently doing a PhD at UWA in Anthropology and Sociology on online fan fiction. I’m not sure if I am doing a resistant reading of this simply because it contradicts some of my earlier thoughts about fan fiction writing and I am just being too stubborn to thing more openly about this, or because I genuinely disagree. Early last year I was thinking about online fan fiction in terms of its interactivity and whether it was/is different to published and physically disseminated works. I was basing a lot of my thoughts around the difference between the written and the oral as described in Jack Goody’s work- mainly his work ‘The Interface Between the Written and the Oral’. From thinking through this I think my conclusion was that although online fan fiction is written, the way in which people tell the stories, listen to comments and feedback, adapt them, and then retell them has more in common with oral traditions rather than written ones. However, with your brief run down of written traditions as written above has me rethinking my earlier conclusion. I’m not sure of myself any more….. I still think there is a difference between the physical written word, and online communication, but I don’t think it is as revolutionary (evolutionary?) as many scholars make it out to be. I would be really interested to hear your thoughts on this topic. Thanks for this Gemma! I’d be interested to consider informal or semi-formal social writing circles of the past to compare to fan fiction. Of course they don’t look much like the ‘cannon’ of great literature and are often lost as ephemera or in private collections. Famous examples are the Brontës’ imaginary worlds co-written by pairs of siblings (1820s), Isherwood and Upward’s alternative Cambridge, or the serial novel written by members of the Detection Club (each author writing a chapter and forwarding it on to the next in a chain) (1930s). Similar circles exist in the 18th century–and this would cross over with your oral interests, with collection of folk tales and dialects (eg the Grimms), and the development of oral/written/performative forms like the satirical print, aphorism or parlour poem. These are social, responsive, and iterative, but I think they are not quite massive enough for modern fan fic. The best place to look for historical fan fic is Byron. People used to send him stories with themselves as Mary Sue heroines giving his tragic heroes happy endings. We know about those sent to Byron and his publisher–but surely there were corresponding circles of friends scribbling stories for each other. That’s research I’ve not yet done! (But I’d claim that both Wuthering Heights and Jane Eyre could be fruitfully read as Byronic fanfic). Perhaps the difference between print and the internet, not in the permanence, or truth of the work that is produced, but in the ability to produce and disseminate that text. Today and in the past it either costs the individual money, or they have an awful lot of luck to be able to get their writing in print and distributed widely. In the early days of fan fiction with fanzines, copies were often printed on demand, and sent around to individuals on a mailing list. Today I can write a bad fan fiction, put it in the internet and have hundreds of people read it within a few days. To use a cliché in media studies, the internet in a lot of ways has compressed time and space, and democratised (to an extent) the ability to hear others and be heard. Absolutely! I agree that the internet has made major differences to degree, speed and scale of reading and writing. Just not (much) to the social actions and reactions of readers and writers.